Associated Black Charities is moving its’ office, and to us, it is so much more than a physical move. 1114 Cathedral Street, now our former “home”, was a building once owned by ABC as a result of a sharp and savvy ABC Board member, who was also one of its founders. It represented a legacy of moving ABC upward and onward to its next level of greatness. And for many years, it was indeed home and witness to so many of ABC’s “firsts”. It also served to buttress ABC in difficult financial times by using the value of the property to secure a short term line of credit and when needed, to refinance debt so that we could continue our service to Baltimore communities. It sustained us during a time of one of our greatest challenges: eleven years ago, shortly after I arrived at ABC, when I had to offer the Board a choice – honor the legacy related to property ownership versus the legacy related to the values, principles, and goals of ABC’s founders. These values, principles, and goals were about greater access for African Americans, better outcomes for families, and a better community for all of the region as the numbers of economically contributing African Americans grew. This was a hard choice for an organization that began as an anchor for the African American community but that found itself -- after years of revenue decline – over $2 million dollars in debt, including a building in need of major repairs. We chose to remain committed to the vision of ABC’s founders; we chose to honor the legacy of expanding opportunities for African American people before holding on to the legacy of the property. It took several years to find a buyer and begin to restore ABC to a healthier fiscal position. We have now come to another crossroad, five years after selling and leasing back. It is not a good fiscal choice to stay given the pricing shift in the Mount Vernon community, we have once again decided to put ABC’s legacy of expanding opportunities for African American people beyond the legacy of holding on to place. We have decided to move. As we prepared to move, I found myself weepy and could not find the cause but then I realized I was mourning. It feels sad to leave a building that represents legacy for African Americans. However, We, all of us at ABC are looking forward. For we are at another crossroad for ABC; we have launched a focused agenda as a foundation. Deciding to actively engage donors, launch an endowment campaign, identify new revenue sources, and create a new fiscal agent entity, we are doubling down on a collaborative agenda to “Change the Future”. Changing the Future means an investment in an economy in Baltimore and throughout Maryland where structural and institutional racism is dismantled and provides equitable opportunities for all people - to work, advance and build financial security and generational wealth to benefit their families and communities. ABC works across Maryland as educator, advocate and supporter in eliminating race-based structural barriers and advance long-term solutions that create new opportunities for African Americans to thrive financially and build a stronger economy for all. So the fundamental values and principles of ABC stand stronger than ever. We believe we choose wisely in selecting a location more economically feasible. We believe we choose wisely in all that we are about to embark upon. We believe our choice honors our founders. Nevertheless, I grieve our departure and the ancestral spirits who gather at 1114 Cathedral Street. At the same time, we are looking forward to the next chapter for ABC and we hope you will join us. WASHINGTON – The Maryland congressional delegation, led by Senator Ben Cardin (D-Md.) and Congressman Steny Hoyer (D-Md.-05), today gathered for a roundtable discussion with experts from the Maryland Center on Economic Policy and Associated Black Charities to discuss potential federal policies that could help close the growing racial wealth gap in Maryland and nationwide. Lawmakers heard case studies of successful local and state partnerships, along with essential questions that can increase the likelihood of developing racially equitable policies. Public policy, historically, has played a role in both creating and dismantling structural and institutional barriers that disproportionately impact marginalized groups, including racial groups. “Increasing economic opportunities for all Marylanders is my top priority. We must continue to work together – at the federal, state, and local level – to make lasting changes to reduce inequality. The Maryland Center on Economic Policy and the Associated Black Charities are doing vital work to address this issue, and I appreciated the opportunity to join them in this discussion today,” said Senator Van Hollen. There are new employment opportunities available at Associated Black Charities. 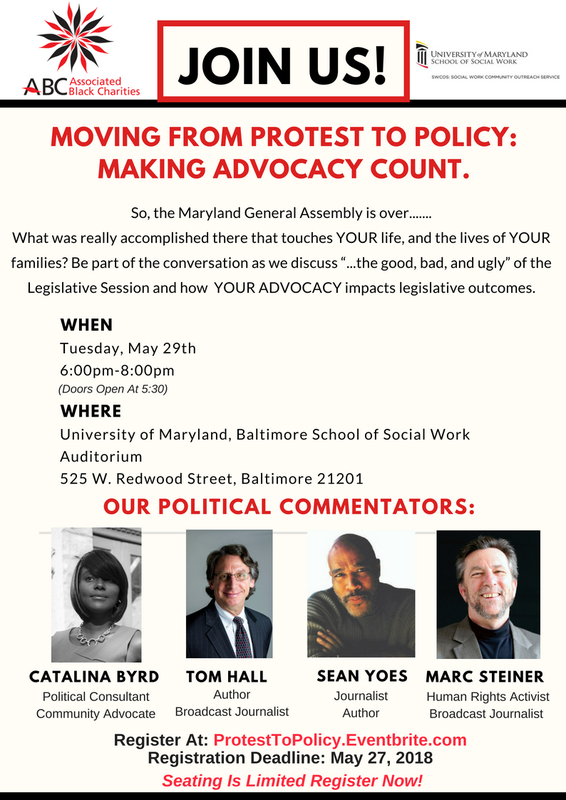 So, the Maryland General Assembly is over...what was really accomplished there that touches YOUR life, and the lives of YOUR families? Be part of the conversation as we discuss “the good, bad, and ugly” of the Legislative Session and how YOUR ADVOCACY impacts legislative outcomes.